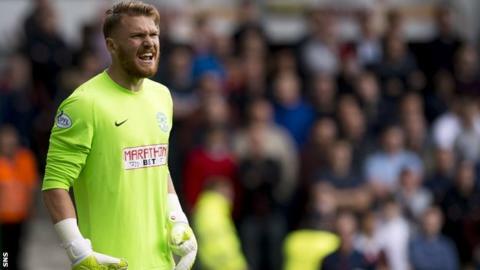 Hull City are unable to recall loaned goalkeeper Mark Oxley from Hibernian. Manager Steve Bruce suggested the 24-year-old would have to return to the KC Stadium, following injuries to Steve Harper and Allan McGregor. However, a player moving between different football associations cannot move back to his parent club until the transfer window reopens. Harper is expected to have a scan on his arm injury on Monday, while McGregor has a shoulder problem. "We have got a goalkeeper at Hibernian so maybe on Monday we will probably have to call him back," Bruce said at the weekend. But the Tigers boss may have to seek an emergency loan or look to his youth ranks to provide cover for Eldin Jakupovic, who replaced Harper in the 2-2 draw at Arsenal on Saturday. Oxley has been the number one for Alan Stubbs' Easter Road side after joining in the summer, and scored a goal in their opening match of the Championship campaign against Livingston. He featured in the Edinburgh outfit's 4-0 defeat of Livi on Saturday evening.